I actually liked the 2.5. Nice comfort all around, stable, decent cushioning, no heel slippage. Only real problem was the occasional toe jamming. The 3.0 look more like a whole new shoe rather than your typical incremental update. Uppers are completely different, and the outsole pattern changed. @TW Staff , do you know if the rubber on the 3.0 is the same as the 2.5? I also felt that it was a whole new shoe rather than just an update of the older version. The Rush Pro 3.0 is a really awesome shoe. Had a chance to try it out on the court last night hitting with @snoflewis. Initial thoughts: This is a fast feeling shoe. Nice combination of speed, stability, comfort and support. Fit is great. No heel slippage. No toe jamming. Good cushioning in a lower profile shoe that feels closer to the ground unlike the adidas barricades where the cushioning in the heel is so thick that you feel like you are leaning forward. Yeah, i was able to test the lateral support and traction. The Rush Pro 3.0 passed with flying colors. I received my pair today (blue colorway). I won’t hit until Monday, but I wore them around the house and for a walk for a couple of hours. The comfort was there from the get-go. My heel didn’t slip at all, which is the biggest gripe I have with a lot of other shoes. I received mine yesterday as well, blue colorway. I won’t be able to get out until next week either I did walk around the house a little bit to break them in. For me, they were a little snug to begin with but after wearing them around for an hour broke in quite nicely. This could be a very good shoe considering how lightweight, comfortable and stable it feels and also comes with a six month warranty. The Rush Pro V3.0 feels light, low to the ground & soft when walking, firms up on hard impacts and is very stable and supportive. Absolutely no heel slippage or toe jamming issues. The traction is really nice & grippy. However, it fits a bit narrow for my (*wide) feet. After a couple hours of play, the side of my feet were aching a bit. The rush pro 3.0s are perhaps one of the few tennis shoe I would consider running in because they feel so well cushioned and don’t have any rigid plastic around the upper. Just got the Blue color and yes.. they are very cushioned. I used to use the old Wilson Pro Staff line and what replaced them. Very old school shoes and made really for hard courts. Heavy shoes.. but stable. I then moved to an Asics Gel Challenger shoe. Been unhappy with the current state of many of the tennis shoes as they seem to be making them for only young players. Moved to a cross trainer last year. I have high hopes for this Wilson offering. I will be outside today.. with them on!!! Walking around house.. loving these!!! They also match our team colors for the spring season!!! I got mine on Friday and today is the first day I haven’t put them on. They need to dry out. I played two hours of indoor basketball in them and another two hours of tennis in them yesterday. They were great in both. I’m playing tennis tomorrow and Wednesday so I’ll write my review very soon. The shoes have stretched a little and are no longer giving me the pain in the sides of my feet. This really is outstanding shoes for playing on hardcourts. The cushioning that I felt Wilson shoes lacked is no longer an issue. The traction is firm and grippy but nicely gives a little on hard stops and skids. Overall, I am very impressed so far. It feels and plays like how the SFX3 plays with more support, better cushioning and feels just as light. The Rush Pro V3.0 runs slightly narrow for my feet, which is really not the fault of the shoes. Hoping the outsole lasts, though. It does feel much softer than the Asics Gel Resolution outsoles. First night out with these shoes, and thus far a very positive experience. It's almost as if Wilson read the critiques from my Rush Pro 2.5 playtest and addressed them in the 3.0. Namely, no more toe jamming and a little more cushion in the forefoot, all while maintaining the qualities that I liked so much in the 2.5 iterations. My review after having the shoes for approximately 1 week. Regardless of how any negative might come across in written word, I WOULD BUY THESE SHOES! Tennis experience/background: I'm 47 years old and a strong 4.0 player. I play mostly doubles as that is really the only option for league play in Central Ohio. I prefer singles so I can run around more and be active. I've been a long-time sufferer of plantar fasciitis and even had release surgery last year. After the surgery I also had a setback when a neuroma was discovered. In a nutshell, my feet are sensitive and shoe selection or comfort is important to me. Describe your playing style (i.e. serve & volley): I’m an all-court player who much younger people describe as quick even though I feel slow at times. I can serve and volley and I can play the baseline too. In singles, I wait and then attack but in doubles I attack quickly to the net. Current shoe: My current shoe is the Adidas Barricade Club. I chose the shoe after visiting a very large tennis specialty store and trying on probably 10 pairs of shoes of a variety of brands. I’m not a brand conscious consumer. I buy what is comfortable and I wanted a shoe with a smaller toe drop. I really like the Adidas Barricade Club! How many hours did you play with the shoe? I’ve played seven hours in the Wilson Rush 3.0 shoe. Two hours were playing basketball on an indoor wooden floor and five hours were on an indoor hardcourt tennis court. Normal Size: My normal size shoe in Nike and Adidas tennis shoes is 9 ½ and my running shoes by New Balance are also 9 ½.
Playtesting Size: 9 ½ is the playtesting size. It fits true to size and looks very similar in shape to the Adidas Barricade Club. Other than a little bulkier toe sole area, they look very similar all the way around. -comfort: This shoe is very comfortable right outside of the box. I’m very sensitive to the bottom of my feet and the wrong shoes can have me hobbling around the day after wearing them. These were great all day. In fact, I put them on when I received them and proceeded to wear them for all activities in life for the next four days. This is unusual for me for two ways. First, wearing the same shoes for too many hours regardless of style and comfort can cause a pain flare up for me. These did not! Second, I usually only wear tennis shoes for tennis, basketball shoes for basketball, running shoes for running, and walking shoes for walking and standing. I do not walk barefoot very often because I my foot issues. These shoes are every bit as comfortable as my Nike Hyperdunk basketball shoes and my Nike Kyrie Irving shoes as well and those are two very comfortable shoes! -arch support: I wear a custom orthotic and have for years. They fit great in these shoes which is another reason why I would make these my tennis shoes. The standard insoles were not glued in and slid out easily. This made it very simple to slide in my orthotic insoles and the width of the shoe is such that they’re not forcing the shoe into some weird shape. Being able to slide orthotic insoles into the shoes is very important to me. -stability/support: I’ve had no issue with stability or support. I read reviews of the 2.5 so I wanted to put these to the test. I played basketball in a two-hour weekly game where I knew I’d be running aggressively up and down the court against 20-year-olds. The support and stability are great and equal to basketball shoes. I prefer to wear a high-top shoe while playing basketball but I took a chance and they held up fine. In my five hours of tennis, I’ve had no issues with slippage, twisting, or any weird steps. -ventilation: Currently I been experiencing swampy feet. Yes! It is as gross as it sounds. These shoes are well ventilated though and you can see through the blue colorway that I’m playtesting these shoes absorb and move the moisture to the outside of the shoe. It does turn the blue into a wetter, darker shade that I’m not super fond of but that’s the price I pay. I’d probably prefer the black shoe for this reason but the blue does give me some extra fashion flare on the court. -sole durability: I’ve not had these shoes long enough to determine how long they’ll last but with a 6-month warranty and a $99 price, how could you go wrong? From the looks and initial quality, they’ll survive as long as any shoe. -toe durability: I’m not a toe dragger but there is added sole for toe draggers. -traction: The traction is very good on both wooden courts and tennis courts. If I had a complaint, it is that they squeal when I shuffle or approach the net on the tennis court the way basketball shoes squeal on a wood court. I noticed this while playing and found it a little annoying. My Adidas Barricade Club shoes do not do this. The traction is great but the squealing is not. Maybe that speaks to the traction and durability? 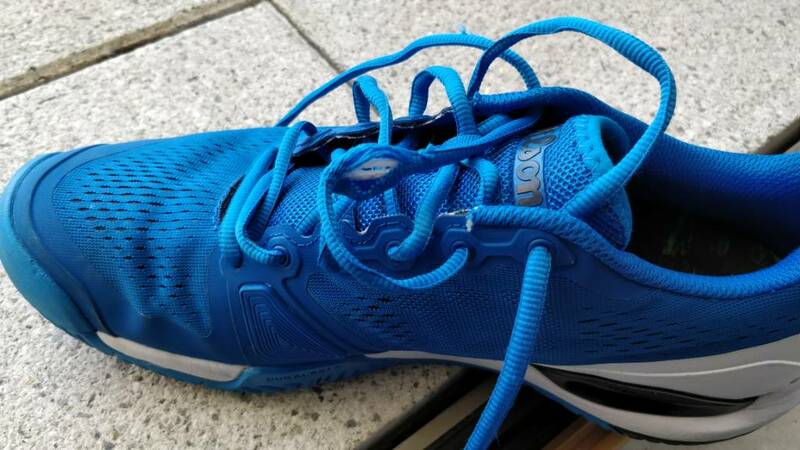 -weight: These shoes felt like very comfortable walking shoes but with tennis performance. The weight isn’t too heavy but they’re not light like my running shoes. General reaction/comments on overall performance: I’d buy these shoes! I’d recommend these shoes! I sincerely hope Wilson continues to make this shoe! It was the first Wilson shoe I’d ever worn and I’m satisfied with their comfort, quality, fit, and performance. Great insoles. It wasn't something I'd paid much attention to because they pretty much all felt similar, but the insoles of the V3.0 feel softer and shape to my toes (*almost like the memory foam). These shoes are really comfortable and supportive. Eh, going to have to amend this. Experienced some very minor toe jamming this evening playing singles. Nothing really bad, but enough to get my attention. The shoes just allow my feet to slide forward a little bit. I am experiencing the same. The factory insoles allow my feet to slide up a bit into the front of the shoe. That could be addressed with my socks or a replacement insole. I have only drilled a bit with them and fed balls in practice so far. Side to side they feel great. Moving up and back I can feel my foot shift in the shoe. They are still the best I have used in years. Not even close to posting a full review. Just some insights... Very positive so far. I just picked up some new Thorlo TX Level 3 Crews and will use them. Those would be the socks I would use for match play as those are my go to socks for years and years. I haven't had that issue, but I came away with slight sore knees yesterday. I don't think it was the shoes. I was doing lots of drills and footwork practice, so it was much more of a workout than actual play. I think I pushed a bit more than I should have because my legs felt like wet noodle after the drills. Maybe because of my wide feet and the snugly fitting lacing system helps my toes to stay in place. Toe jamming = Irritating pain. I hope it doesn't happen. Same here but it's ok. I use orthotics instead of original soles. During my training or match I lace the shoe another time but more tightly and then zero issue. Maybe it's because of the heel to toe drop. America. Perhaps it was a coincidence, we’ll see as I’m playing indoors for a few hours tomorrow so I will get a good feel for the shoes. I switched indoor and outdoor last week, no issue. I did my weekly training indoor and a match outdoor. Maybe it's the change indoor-outdoor which caused you problems. It's been some week I started playing outdoor but the first time at the end of winter was hard. I remember it was my first match outdoor (and first time I used the shoe) and firstly I didn't like how perform the shoe. I took another pair but since 2 weeks I use the Rush Pro 3.0 again and it's good, I definitely feel good in this shoe. In this time I play on hard court only, never tried the Rush Pro 3.0 on clay yet. 10+ hours on the Rush pro V3.0. So far, it's been great. Really comfortable with good lateral support. The outsoles are going strong with no real sign of wear. I have not noticed toe jamming issues and have not had problem with the laces or the lacing system, yet. One minor thing I noticed (after a hard day of playing) was that the shoes could have come with a bit more arch support. Too much SQUEAK! I play doubles and an all court game in singles. In doubles everytime I approach the net and split step, my shoes squeal very loudly for every minor step I take. I swear it's scaring my partner into missing shots and throwing off my concentration too. I won't wear these for doubles because of the loud and constant squealing. I thought it was maybe just at my home courts but I played elsewhere last night and it was bad there too. Maybe it's your surface. I played indoor and outdoor 6 times now (more than 10 hours) and it never bothered me. I didn't notice it contrary to my Asics shoes but I would pay more attention the next time. For some reason I always liked that sound - an audible indication of good footwork. Reminds me of the basketball court. Exactly like the basketball court! The issue is I'm scaring my doubles partner when I'm coming in from the baseline and moving into my split step. It would be fine for singles because I don't care to annoy the opponent however it would also tip them off that I'm approaching the net. I also hear the squeaks, but just like @red rook I like the sound it makes. Really loving these shoes. Tennis experience/background: Played a bit as a kid and a year in high school, then returned to the game in my 30’s. Now I’ve just hit my 40’s, but I am still relatively fit. Currently play rec and USTA matches at the 4.0-4.5 level. Describe your playing style: Baseline grinder trying to adapt a more all-court game. Semi-western topspin forehand and a flatter compact two-handed backhand which I prefer to take early. Serve is awful so I need to back up my service games with groundstrokes and movement. Play a fair amount of dubs, where I like to be aggressive at net, but don’t often serve and volley. -comfort: The general comfort of these shoes is terrific, feeling that way straight out of the box. Since the original Rush Pro, I’ve enjoyed the bootie-like fit with the integrated neoprene tongue. The mesh uppers are soft, the heels have a plush collar, and the cushioning underfoot is very good. I felt cushioning has improved from the 2.5s, particularly in the forefoot. It has come at the slight expense of some of that low-to-the-ground feel that the 2.5s had, but the 3.0s still feel low and quick, particularly for a durability shoe. Overall the 3.0s seem to run a tad bigger (length and width) than both my Resolutions and 2.5s, and sport a more generous toe box. Unfortunately there is one knock on the comfort factor: the shoes allow my feet to slide forward a bit when coming to a hard stop, which resulted in some toe jamming. I actually felt like my feet were sliding more in these than in the 2.5s, where I also encountered some toe jamming. Though it wasn’t really much worse, I think because of the 3.0’s bigger toe box. -arch support: When I first put on the shoes I felt like the placement of the arch support was a bit off, and may be lacking towards the front of my arches. However when playing it seemed to be a non-issue. I rarely have issues with my arches, so it could be problematic for those who require optimal arch support. -stability/support: Overall I give the 3.0s solid marks in this department, but I was hoping for a bit more. Although I loved the comfort of the new mesh uppers, and they felt generally stable on lateral movements, there was a little extra give where I wasn’t quite as confident as I am in my usual kicks. I feel like my feet weren’t quite as locked in compared to my Resolutions or even the 2.5s. And there was the aforementioned issue of my feet slidng forward. Over the duration of the playtest, I felt the need to cinch up my laces a bit tighter as the shoes seemed to open up a little. My heels did lock in nicely though, and I didn’t experience any heel lift that so many complain about with the Resolutions. -ventilation: Ventilation seems much improved, particularly compared to the original hot box Rush Pros. Rejoice! I’ve yet to play in sweltering heat as I’m in the North East, but I think I’m going to be happy with the breathability. -sole durability: At this juncture no premature wear, even in my high wear area under my big toes. I think durabilty will be very respectable. Seem to be on par or better than the 2.5s, which I burned through in about 4 months (for a point of reference Resolutions tend to last me a little over 5 months). -toe durability: I’m no longer a ridiculous toe dragger on serve, so I’m putting less wear here these days. However, these shoes seem to be very solid in the toe durability department, and have a nice beefy toe cap. So drag away toe draggers! -traction: From the hardwood floors of my living room to the hardcourts of my club, I was squeaking away. Like the Rush Pro 2.5s, I found the 3.0s to have some pretty sticky rubber, falling more towards the grip end of things on the grip/slip spectrum. I felt sure footed and traction was great, but personally I prefer a little more give from my outsoles. Between the toe jamming and extra grip, I was a little more reluctant to jam on the brakes when chasing down a drop shot. -weight: For a durabilty shoe, these Rush Pro 3.0s are ridiculously light. Not only are they objectively light from a pure static weight standpoint, but they also feel light on your feet. I certainly cannot complain here, clunky these shoes are not. I really wanted to love these shoes, but I just can’t perform at my very best when I’m concerned with my feet sliding around. It’s great that Wilson has improved the cushioning and breathabilty, however now addressing the toe jamming would be my major concern. Otherwise, it’s a pretty great shoe. There’s a healthy dose of performance and comfort, but for me I feel like the latter is the real selling point. If I were going to be on my feet all day feeding balls, or just heading down to the court for a hit with my niece, I’d definitely choose to put these on. With my Resolutions, I’m taking those puppies off ASAP when I’m done playing, but these I can just loosen the laces and I’m still good to wear them. I’m happy to have the Wilson Rush Pro 3.0s in my shoe quiver, but I probably won’t be lacing them up for my most serious of matches (granted how “serious” can it get when you’re a 40 something 4.0?) . -comfort: The general comfort of these shoes is terrific, feeling that way straight out of the box. Since the original Rush Pro, I’ve enjoyed the bootie-like fit with the integrated neoprene tongue. The mesh uppers are soft, the heels have a plush collar, and the cushioning underfoot is very good. I felt cushioning has improved from the 2.5s, particularly in the forefoot. It has come at the slight expense of some of that low-to-the-ground feel that the 2.5s had, but the 3.0s still feel low and quick, particularly for a durability shoe. Overall the 3.0s seem to run a tad bigger (length and width) than both my Resolutions and 2.5s, and sport a more generous toe box. Unfortunately there is one knock on the comfort factor: the shoes allow my feet to slide forward a bit when coming to a hard stop, which resulted in some toe jamming. I actually felt like my feet were sliding more in these than in the 2.5s, where I also encountered some toe jamming. Though it wasn’t really worse, I think because of the 3.0’s bigger toe box. -stability/support: Overall I give the 3.0s solid marks in this department, but I was hoping for a bit more. Although I loved the comfort of the new mesh uppers, and they felt generally stable on lateral movements, there was a little extra give where I wasn’t quite as confident as I am in my usual kicks. I feel like my feet weren’t quite as locked in compared to my Resolutions or even the 2.5s. And there is the aforementioned issue of my feet slidng forward. Over the duration of the playtest, I felt the need to cinch up my laces a bit tighter as the shoes seemed to open up a little. My heels did lock in nicely though, and I didn’t experience any heel lift that so many complain about with the Resolutions. -traction: From the hardwood floors of my living room to the hardcourts at my club, I was squeaking away. Like the Rush Pro 2.5s, I found the 3.0s to have some pretty sticky rubber, falling more towards the grip end of things on the grip/slip spectrum. I felt sure footed and traction was great, but personally I prefer a little more give from my outsoles. Between the toe jamming and extra grip, I was a little more reluctant to jam on the brakes when chasing down a drop shot. I really wanted to love these shoes, but I just can’t perform at my very best in them when I’m concerned with my feet sliding around. It’s great that Wilson has improved the cushioning and breathabilty, however now addressing the toe jamming would be my major concern. Otherwise, it’s a pretty great shoe. There’s a healthy dose of performance and comfort, but for me I feel like the latter is the real selling point. If I were going to be on my feet all day feeding balls, or just heading down to the court for a hit with my niece, I’d definitely choose to put these on. With my Resolutions, I’m taking those puppies off ASAP when I’m done playing, but these I can just loosen the laces and I’m still good to wear them. I’m happy to have the Wilson Rush Pro 3.0s in my shoe quiver, but I probably won’t be lacing them up for my most serious of matches (granted how “serious” can it get when you’re a 40 something 4.0?) . Tennis experience/background: Played juniors until 18, then did not play again until I was 36. I am now a 4.5 (mainly doubles) player. Describe your playing style: I am a doubles player with a fairly good serve who works my way into the net. I can hold my own on the baseline when needed. -comfort: Right out of the box, I loved the feel of this shoe. It has great cushioning in the forefoot as well as the heel area. I like the extra mesh they have added on this version vs. the 2.5. I loved the secure fit of the attached tongue. I also enjoyed that the toe box area was a bit wider. -arch support: I have a medium width food with a lower arch. With some shoes, there is a period where my arch will ache while playing the first few times, I had no issues with this shoe. It again was very comfortable from the get go. -stability/support: I believe this is a very solid & stable shoe. I have bad ankles and did not feel at risk for rolling them. Stability was great laterally, although I do not slide. Soles were somewhat sticky, but this is not an issue for me. Felt stable going forward and back too. The lacing system was great & luckily I had no issue with them fraying. Also felt that my heels were locked in & secure. -ventilation: I have worn every version of the Rush Pro and they just keep getting better with the ventilation. This one is better than the 2.5s, although yesterday I did experience the insoles getting wet after 2+ hours of play. I play on an omni court & when I went to get the sand out, I noticed the forefoot of the insole was quite damp. -sole durability: At this point there is no premature wear. I definitely feel as though I will not wear through them in a 6 month period. Once again they have made a very solid & durable sole for the Rush Pro line. -toe durability: I am a toe dragger, especially on my serve. I also sometimes drag my toe on my forehand approach shot if I am slicing it...I also sometimes drag my toe on my backhand...all this being said although some wear is seen, the toe is very durable and solid. I do not feel as if I would wear through it anytime soon, not even in 6 months. -traction: As I mentioned earlier, this shoe has somewhat of a sticky outsole. They definitely squeak on a hard court, of course on an omni court there is no sound. -weight: For a stability/durable shoe, this shoe is lightweight. I never felt as if they were clunky or got too heavy feeling while wearing them to play or even after playing. It isn't as light as say your Asics Solution Speed but definitely lighter than the Gel Resolution that I have worn in the past. I really love these shoes. The improvements made from the Rush Pro 2.5s has made this one of my favorite shoes. These shoes are solid, comfortable, sturdy and the funny thing is I did not feel the need to get them off my feet right after playing. I have not tried yet, but I may even wear these to the gym. These are going into my weekly rotation...at first I thought I was not going to like the color, because I got the white ones with a tad bit of blue near the sole...I like flair & color in my shoes BUT I was able to wear colored socks to add the extra pop of color and was just fine wearing the white shoes. I would like to thank Wilson & Tennis Warehouse for allowing me to do this playtest...this has probably been my favorite shoe to date that I have been able to playtest. Describe your playing style (i.e. serve & volley): All court style; always looking for the opportunity to move forward to end the point. Other players generally comment that I move pretty well and am pretty fast for my age (late 40s). -comfort: Of all the durability shoes I have worn over the past 10 years, this is hands down the MOST comfortable. The seamless upper ensured there were no hot spots causing any rubbing or pinching. There was no break-in period at all. The shoes were comfortable straight out of the box. I have experienced heel slippage issues with Asics shoes in the past and these were snug in the heel. Cushioning is excellent. Heel cushioning is one of the Barricade’s strengths, but unlike the Barricades which have a thick midsole under the heel which gives me the feeling of wearing heels, the Rush Pro 3.0s feel a lot lower and closer to the ground without sacrificing any cushioning in the heel. Forefoot cushioning is also very good. I would never consider running in a shoe specifically designed for tennis, but the Rush Pro 3.0 is the first tennis shoe that I deem comfortable and cushioned enough to actually run 3 miles in. I actually wore these to the gym for a workout prior to heading to the courts to hit against the wall and then do some agility footwork drills. I loved how comfortable they were. Normally, I want to loosen the laces on my tennis shoes as soon as I’m done playing because they just aren’t as comfortable as my running shoes or my Lotto Quarantas which feel like absolute bliss to lounge around in. -arch support: I wear a custom hard orthotic so generally arch support in a shoe is not an issue as long as the shoe does not flex much under the arch or is not so narrow that my orthotic does not seat properly. The Rush Pro 3.0s allowed my custom orthotics to seat properly. -stability/support: I was concerned that a shoe with a completely seamless upper would not offer enough support or provide ample stability, but my concerns were unfounded. The Rush Pro 3.0 offered plenty of both, however, at 155#, I am not a heavy guy either. -ventilation: My feet don’t sweat profusely and I didn’t have any discomfort due to ventilation. -sole durability: the rubber compound of the outersole is definitely designed for grip over long life. After 15 hours or singles play (drilling, rallying, point play), there was significant wear on the lateral sides under the forefoot where I have already gone through the tread. There is still a reasonable amount of rubber left before I reach the midsole. So far there is no degradation in grip and traction even though the tread has gone bald in certain spots. The tread under the forefoot and big toe on my right foot is also showing significant wear. I wore through the Zoom Cage 3s in less than 3 months and the Rush Pro 3s appear to be on a similar timeline. The outersole will not last the entire 6 month duration but it’s not unexpected given the great traction and feedback they provide. -toe durability: Toe durability has been excellent. I have a tendency to wear through the top and tip of the left shoe since I tend to drag by toe/shoe when hitting the bh slice. So far the rubber cap on the toe box has held up very well. I have worn through the outersole and Drag-On material at the tip of the shoe in less than 4-5 weeks with Zoom Cages. I can tell I won't experience this with the Rush Pro 3.0. -traction: I love the amount of traction the shoe provided. The outersole compound seems to be on the softer side compared to most durability shoes which is a good thing. They grip exceptionally well when I need them to yet have a certain amount of give/slide when I want as well. They do squeal a lot if your legs and feet are active as they should be. -weight: for a durability shoe, the Rush Pro 3.0s feel very quick and light. They felt very agile unlike the Barricade Classics which in comparison feel quite chunky and big. I really love the fit and feel of the Rush Pro 3.0. This looks and feels like a top of the line shoe offering. They perform excellent on court – I feel quicker and more agile in the Rush Pro 3.0 than in any other durability shoe I have worn in the past. I would not hesitate to purchase these shoes in the future. Aesthetically, they look fantastic as well. I received the Black/White colorway which is very understated. With so many of the tennis shoe manufacturers offering such colorful kicks that pop on the court, they just don’t look quite right off the court. Not so with the Rush Pro 3.0. These can be worn in any casual environment off the court without calling attention to the shoes. They have earned the #1 spot on my all-time favorites list due to their comfort, performance, and handsome looks! Thank you to Tennis Warehouse and Wilson for offering this playtest! Thank you Wilson for designing and offering the best tennis shoe ever to date! Holding off on writing a review because I want to test the shoes' durability a little more. So far, though, I am really impressed by how much Wilson has improved the Rush Pro line since the 100 Year Anniversary issue. It's really a great high performance shoes that can be compared with the best of the best shoes in the market. They are very comfortable. They’re more durable than any Nike pair I’ve ever owned. I just dislike the squealing sound when playing and going into my split step. Tennis experience/background: Hit for H. S. many years back, and former college player as well. Now hit with 4.0 league, and rec hitting, most of the time singles and occasionally doubles. -comfort: Very comfortable right out of the box. One reason I liked the Asics were that they were comfortable out of the box, and so were these. Has good stability along with the comfort. Possibly because of my foot shape and size, these shoes were extremely comfortable! With these shoes, my feet are comfortable even after 2 straight hours of singles hitting with a lot of running on court, and can still keep shoes on and still be comfortable, without the need to remove them after so much time, as I experienced that with other shoes were you need to remove them after so long, but not with these. Plenty of room for my toes without any toe jamming,( I have had toe jamming with other tennis brands), just a great comfortable fit! Foot does not move around in shoe and heal stays in place, just perfect comfort. Size was true to size, as all my shoes tennis and casual and work shoes all are size 12 and this was very much true to size. -stability/support: Very stable with lateral movement. For a light weight shoe and comfort of these shoes, the support and stability was top notch. My foot fit these shoes perfect, snug heal, no toe jamming, foot did not move inside shoe at all. I assume my foot shape and size is just right for this shoe. These shoes fit me like a glove! -ventilation: No issues with ventilation at all. Very comfortable . These shoes kept my feet cooler than the Asics I typically wear. Wore these for a while after hitting, and were still comfortable no ventilation issues after a long time wearing them without removing them. 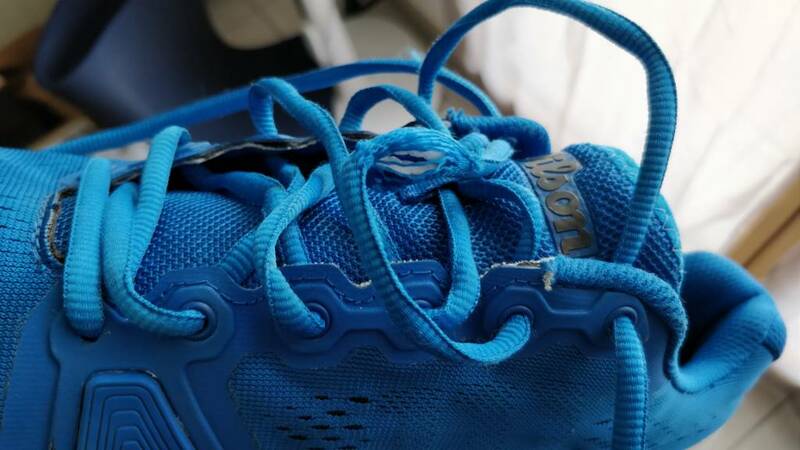 -toe durability: unfortunately for me I drag my toe on serves, but so far it looks like the toe durability should not be an issue, as shoes holding up fine. -traction: Traction is also a no issue with these shoes. I tend to cover entire court, and like to run, and support, stability and traction all goes together very well. -weight: relatively light weight shoe, as this is one of the many features I look for in a shoe, as I do like to run, as I can cover a good amount of the court, as I have good endurance and can run down younger hitters, so I prefer a relatively light weight shoe, and these fit that nicely . I typically run down shots where I see others just let them go by, so I do cover a great deal of the court, and I need a light weight shoe so I will be not weighed down with heavy shoes. These shoes are light and still has stability/support. Beside comfort, being light weight is my next preference in a tennis shoe. This shoe will not feel heavy on your feet at all. General reaction/comments on overall performance: I must say, Wilson got this shoe right! The comfort , stability, weight, support, durability is all there! Actually there is nothing to dislike about these shoes! I loved the Asics that I typically wear as the comfort and weight were just right for me, but after wearing these on the court, my feet still feel comfortable where I can keep them on and continue to feel comfortable. I must say, this shoe will be my go to shoe for future purchase, as it feels like they were custom made for me. Thank you for the playtest ! I put a lot of thought in the above comments, and answered each area to the best I could while being very truthful, as I appreciate the playtest, and now found my next go to shoes. I never thought that I would replace the Asics I typically wear, but these shoes are by far the best I ever wore. Like I said earlier, there is nothing to dislike about these shoes, Wilson got it right! Thank you! there is nothing to dislike about these shoes, Wilson got it right! Thank you! Tennis experience/background: Played mostly singles in high school and college in the late 80's. Currently just playing recreationally at around 4.5 level playing both singles and doubles. Describe your playing style (i.e. serve & volley): Used to play more of the baseline grinding style of tennis being more of a counter-puncher than an attacker. Currently trying to play more as an attacker trying to end points early. Still a baseliner but always look to try to hit winners or hitting big shots from the baseline to create the short balls to attack. I also try to fight for every point and not give up easy points. I'm really hard on my feet and shoes. How many hours did you play with the shoe? Approximate 25 hours of playing. Around 3-4 hours of use as walking shoes. -comfort: As most reviewers mentioned, the comfort is outstanding. I can honestly say the Rush Pro V3.0 is the most comfortable (*competition level) tennis shoes I have tried so far. Most flagship model tennis shoes are built tough and heavy, but the Rush Pro V3.0 somehow made it light & balanced the comfort/the support really well. It was almost pillowy compared to the shoes with hard outsoles without losing any support. One thing to note for the wide feet players is that my little toe (*both sides) felt a bit jammed when I initially wore them. I also had a slight soreness on the sides of my feet on the first day after I was done playing because it felt a bit tight. Those issues never came back after around three-four hours of initial usage. -arch support: I have flat feet and would have appreciated a bit more arch support, but that's more of an issue with my feet than the shoes. It didn't feel like it lacked the arch support. I just would have liked a bit more, but again, that's more of a personal issue than the fault of the shoes. -stability/support: Before the playtest, for some reason, I was having a little tenderness in my left archilles. (Not sure what it really was, but I am now thinking my current shoes are a bit too heavy and hard soled for my left ankle, which was once badly injured a long time ago.) Since wearing the Rush Pro V3.0, the worrisome pain has reduced to almost none existent. I believe the support plus the comfort was the answer I needed for my tender archilles. The lateral support was great. I never had any issues with support when I had to make quick stops or directional changes. The lacing system held my feet tightly but comfortably when I had to make quick accerations to get to the balls or making hard stops afterwards. The lacing system was a feature that doesn't get mentioned too much, but the shoes' lacing system is probably the best I have tried. I usually have to tighten up my shoes tighter and tighter after each play because the lacing system gets looser and could feel my feet move. It usually happens with every shoes. After a while, I would have to double knot because the laces were too long to be just tied in one knot. With these shoes, I never had to tighten them up tighter. It remained and stayed in its original shape, which is really impressive. -ventilation: My feet never felt like they were being baked. The mesh upper material must have ventilated heat well. My feet usually get really sweaty and clammy (*sorry) if the ventilation is bad. Never really had the need to remove the shoes because they were too hot. -sole durability: As seen in the pictures above, the only wear area are the big toe area on both sides with the right side having a bit more wear. That was after around 25 hours of usage on hard courts. I expected to see a lot more wear because the outsoles felt soft and made lots of squeaky noises making it seem like the soles were getting worn off. Also, I am really hard on the shoes because I run hard, aggressively and flat footed. -toe durability: As mentioned above, I expected a lot more wear. The actual wear is barely visible with only the right side showing a bit more wear. The durability is outstanding. -traction: The outsoles feel soft and really grippy. When I make the hard stops, or directional changes, the squeaking sounds get really loud and noticeable. It's a personal thing, but I love hearing the sound. It makes me feel like I'm playing harder more seriously than I actually am. With having both tight lacing system and the grippy soles, it was confidence inducing to go after the balls that seem just out of reach. My footing was always secure with lots of grip and stability. -weight: It feels a lot lighter than my current shoes but offers just as much support and stability. Usually, the light shoes don't offer the same stability as the heavier competition shoes, but the Rush Pro V3.0 feels secure and supportive while having really light feel. It offers the best of both worlds, the comfort and playability. General reaction/comments on overall performance: I am really trying to nit-pick by saying my littles toes felt jammed and sides of my feet ached. There is nothing to dislike about the Rush Pro V3.0. I love the performance aspect of the shoes with awesome comfort, support and securedness when aggressively moving. I also love the color scheme. While I love the support of the most flagship model tennis shoes, I mostly cannot wear them outside the tennis courts. It's hard to wear black and orange, or all neon yellow shoes with normal clothing and not look ridiculous. With these shoes (*mine were blue and white), I wore them around proudly and comfotably. Thank you, TW. Thank you, Wilson. Thank you so much for the opportunity. This was an awesome playtest. Did I mention I love these shoes? Did I mention I love these shoes? need to shout it in larger font, bold text and highlighted in red! Tennis experience/background: Played two years of HS tennis and one year of junior college. Lots of coaching at the HS level and some at DIII. Dir. of tennis in my little town for 20 years. Been stringing for 27 years. Describe your playing style (i.e. serve & volley):All Court player ..came from a singles background ..doubles these days. 4.0 plus player. Modern FH.. OHBH. Current shoe: Asics Gel... various models and their cross trainers also..
How many hours did you play with the shoe? 15 Hours. -comfort: Very high score for comfort. In the last few years I have had issues finding a shoe that offers decent comfort. Most of the shoes made these days seem to be lighter and designed for speed and for younger players. This shoe is sort of a throw back to the old days. Right out of box. Easy on feet and legs. I have two repaired knees and an iffy back from my years of playing court sports. I have had to resort to using cross- trainers when I can't find a decent "tennis shoe". -arch support: This never really seems to be on my radar unless the arch support is terrible. I had a very bad experience with a New Balance shoe that put me on the sidelines a few years back. If I feel any issues I am out of the shoes in a flash. These do not cause me any issue. I have normal arches. -stability/support: Again, with repaired knees and iffy back.. this is a hot point for me. Stability/support was outstanding. No bad reaction from the shoes in the play-testing. No rolled ankles.. This shoes sort of took away my normal fears of going too hard out there. -ventilation: I can see that Wilson went out of their way to make this a high lighted feature of this shoe. I tested this shoe in the NE in the spring.. never got to FLA.. I use a very high end sock that works well with almost any shoe. I had no issues with my feet getting too hot. Came out of shoes after a session and was very happy. -sole durability: 10/10. The shoes show very little wear after the play-test as you can see from other reviews.. and the great pics posted by others. These remind me of the Wilson Pro Staff line I used to play years back.. 15 Hours and they are close to 90% I would guess of tread.. .
-toe durability: This is not of an issue for me in general.. but as stated above... close to no wear. Wilson also beefed up that area of the show for folks that wear that section of the shoe. -traction: Here is where I might have wanted a bit less traction. I like my shoe to have a bit of slide to it. If you are looking for a shoe with great traction.. this is it. -weight: The weight was very good.. for a durability type shoe. If you are looking for a super fast and light show this might not be for you. The weight was great for me..
General reaction/comments on overall performance: I waited as long as I could to post a review as our weather has not been the best in the NE for tennis... and many have said the same things as I have said. To me.. Wilson hit this one out of park. I have been looking for a show like this for a last few years. Throw-Back features with some great new concepts in shoe. The only real issue I had was my feet sliding forward when I was not using my normal sock... when I moved to my normal ones... no more issue. Loved the shoes. Thanks to TW and Wilson... great tennis shoe!! !